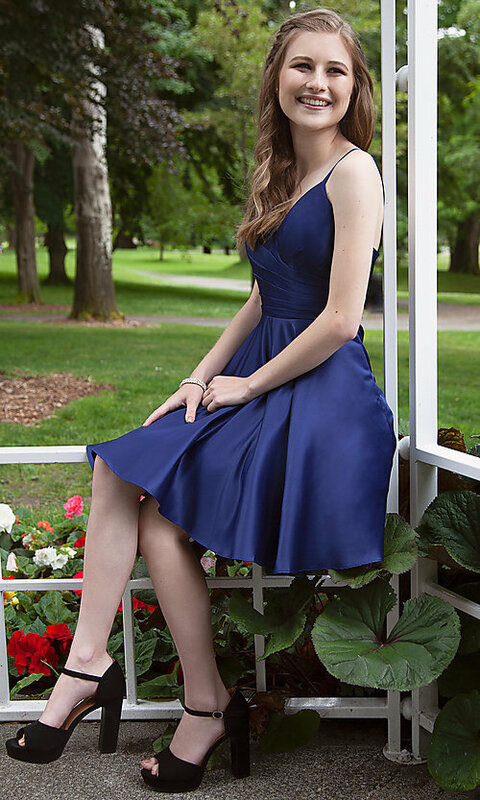 Stylish and versatile, this satin homecoming dress by PromGirl makes looking great at semi-formal parties a cinch. A cross-pleated bodice on the adorable little party dress catches the eyes as it wraps across the body to fashion a flirty surplice v-neckline. The trendy crisp pleats accentuate the figure with a fitted shape and lead to thin spaghetti straps over the shoulders. Sizing is made easy with the delicate straps of the hoco dress that adjust to your liking with one slide, and a flared tulle-lined skirt provides wiggle room around the hips. Finishing the homecoming dress, smooth satin adds shine to the design, while side pockets offer a convenient place for little essentials.